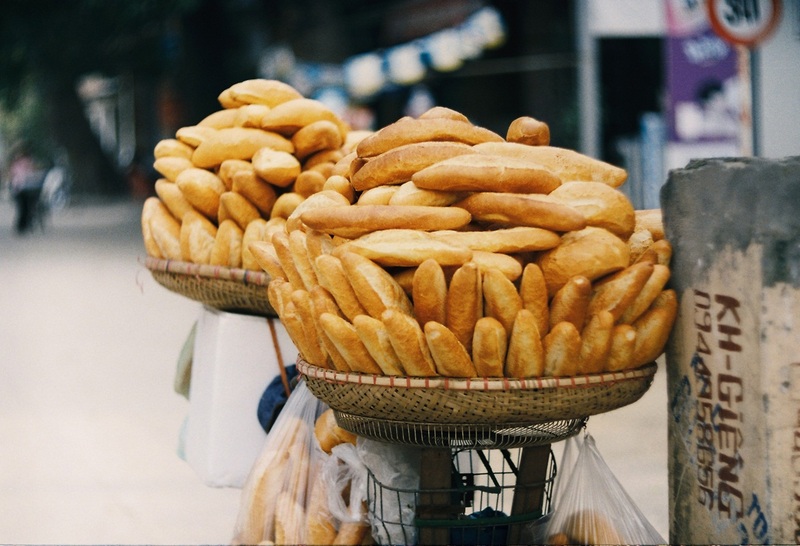 No need to introduce any further, one thing I can make sure is that Hanoi cuisine would immediately amaze you with its complicated taste and definitely become a highlight while travelling in Vietnam. Why? The culture lies in each palate is far more from subtle than what you have tasted before in others places. 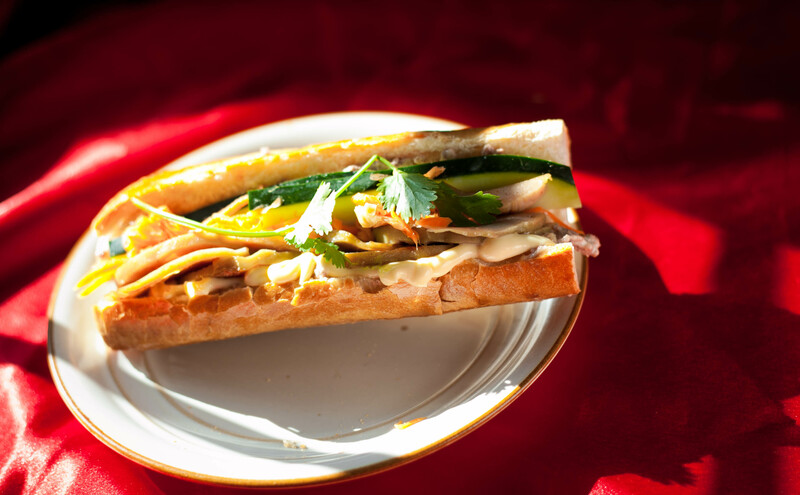 In this post I will recommend and also describe about 10 most famous dishes that you may want to eat in Hanoi. Pho Vui (Happy Pho): Hang Giay strt, Hoan Kiem dist. Place to eat: You can easily find this kind of dish in every corner of Hanoi, all are good I have to admit that. 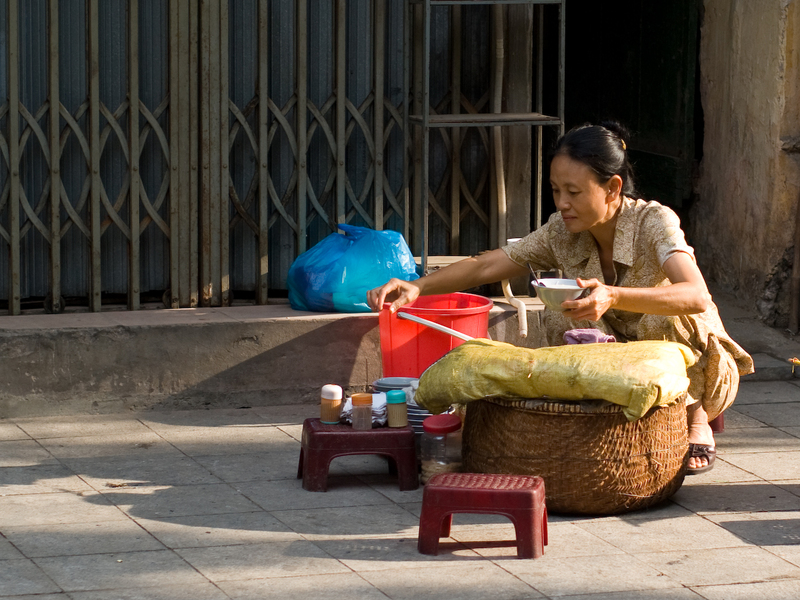 You may see a woman sitting in a pavement with a big bamboo basket in front of her, if she doesn’t sell bread, then she sells Xôi. A rolled caked stuffed with fine chopped pork and mushroom, topped with fried onion, served with special herbs and pork sausage put into dipping sauces. I have to remind you that each dish has different dipping sauces and herbs, both are to enhance the flavor of the main dish so I strongly recommend you to eat all them together to create the best and truly taste of the dish. The standard to evaluate a dish is mostly based on its sauces. The rice sheet is extremely thin and delicate by steaming a slightly fermented rice batter on a cloth that is stretched over a pot of boiling water. My favorite dish, when I think about Bun Cha I immediately hear a little voice whispering “Yummy yummy yummy” in my head. 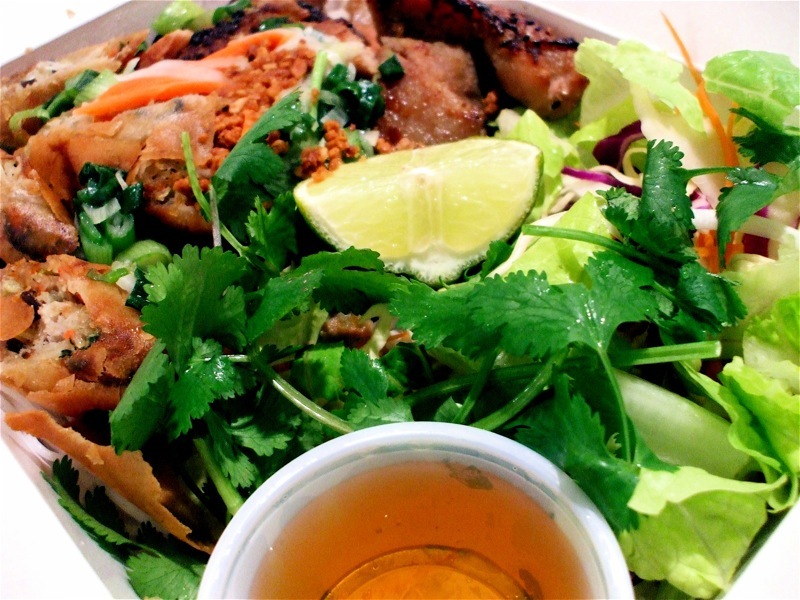 This is a dish of grilled fatty pork, fine chopping pork, cold noodles (bún), particular herbs and dipping sauces. There are also another version of this dish which was adjusted to fit the appetite of the Northern, you can read about it here. 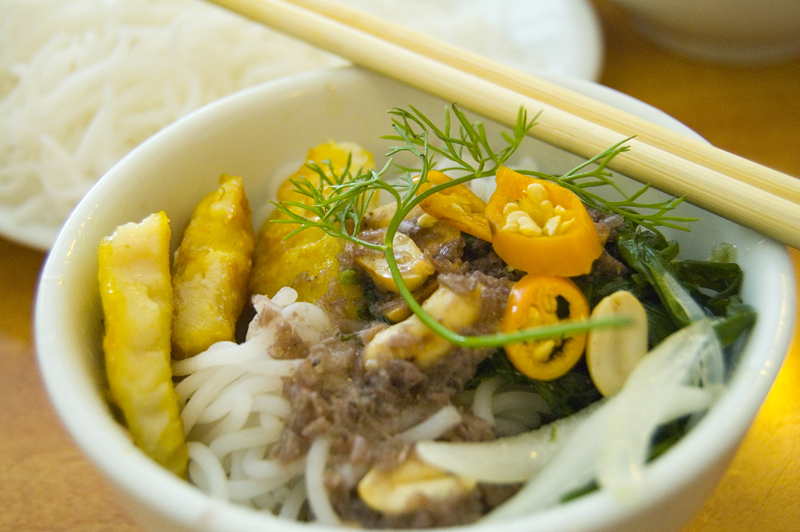 Travelling in Vietnam means that you could eat a dish in different versions. One of Hanoi’s most famous specialties is Cha Ca La Vong (La Vong grilled fish pies). 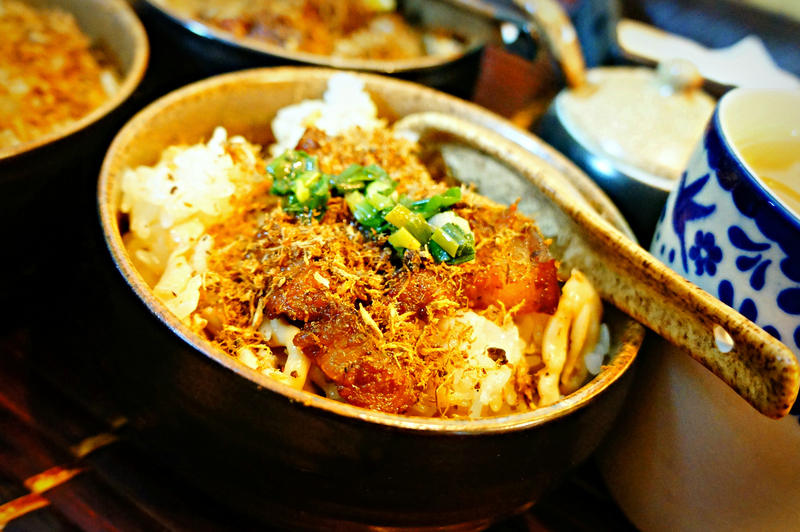 The dish was invented by Doan family and has quickly become so popular that the name of the street where it is served was changed into Cha Ca (fish pie) from its former name Hang Son (Paint Street). 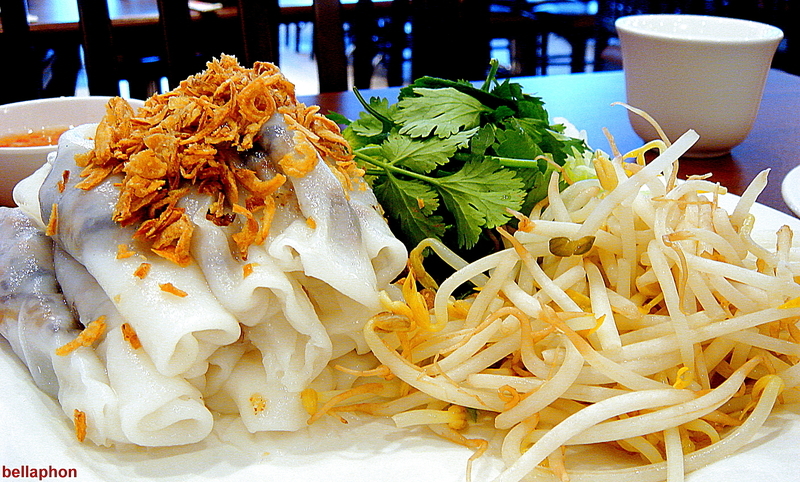 This dish contains exquisitely grilled fish served with bún (cold noodle) peanut, green onions, dills and shrimp paste. The fish is carefully chosen so that there are not too many bones and fishy smells. 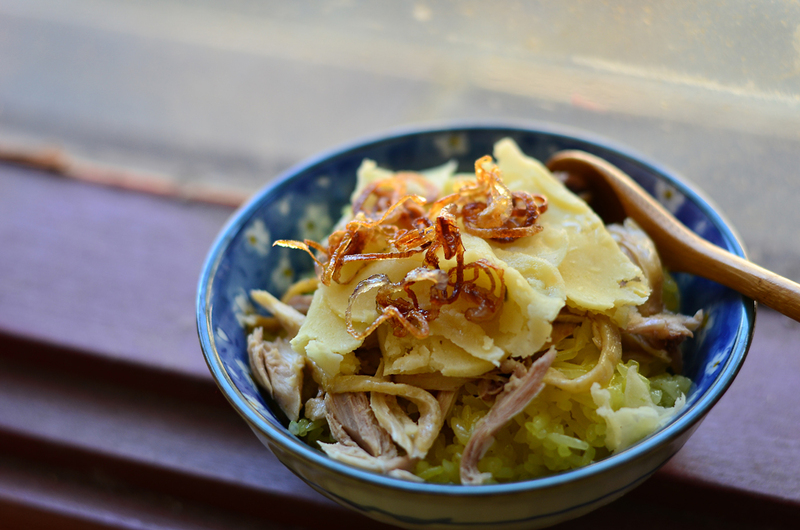 A glass of bia hoi or tra da will definitely give your meal more flavor. Cha ca La Vong restaurant: 14 Cha Ca strt, Hoan Kiem Dist. Notice: You may have to wait and also the price is quite high, however they’ve monopolised this dish. After a long day wandering and eating Vietnamese traditional food, how about having a Western diner in a nice restaurant? I think this would be the best to enjoy your holiday, at this point it hard to recommend some names because some restaurants adjust their flavor to fit Vietnamese appetite, but there are 2 restaurants that I really love is Pots ‘n Pans 57 Bui Thi Xuan strt, they serve Vietnamese cuisine and La Biande at 10 Nam Ngu strt for French cuisine, highly recommend these places, the price is not high at all for such amazing food, after all I don’t mind spending money on real good dishes. Hoping that my review could make your travelling in Vietnam memorable especially in Hanoi. My next post is “What to do in Hanoi Part 3: Hanoi drinking”, reviewing about Hanoi custom in drinking coffee: Weasel coffee in Vietnam and how to make one, as well as Bia Hoi and Tra chanh (fresh beer and lemon tea) – an indispensable culture of the young.